I have been on a steel cut oats kick lately. Partly because contrary to my last post, I have been attempting to cook in a healthier way for my Grumpy. We found out recently that his cholesterol was way too high and with the stressful life we lead, that is not a good thing. 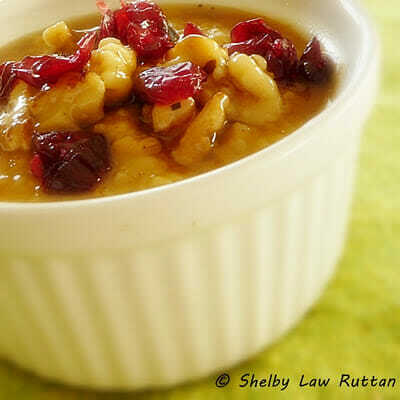 The Sauteed Steel Cut Oats with Cranberry Infused Maple Syrup was my first try with something out of the ordinary – and it was a big hit here. So much so we have had it several times since I first made it. Leslie of The Hungry Housewife grabbed my attention to her Pumpkin Pie Oatmeal which I had to try. I did and loved it and of course the next time I made it I had to change it up and make sure I had some maple-y goodness in there too. I just to have maple syrup with certain things, and oatmeal is one of them. After all, I am a country girl who was born and raised in a maple producing area, I had to do something with the maple walnut thing! Grumpy tried the oatmeal and really didn’t care for it which kind of surprised me because he loves pumpkin. I loved it but I had to make just regular oatmeal for him. He is pretty picky if you ask me so I really shouldn’t have been surprised, however, at least he gave it a try! I ate mine the way you see it here. Grumpy made toast with peanut butter, mixed some brown sugar in his oatmeal and ate it on TOP of his toast! I thought that was weird, however he was eating healthy so I didn’t gripe that he didn’t like my oatmeal. Which way would you prefer to eat your oats? Bring water and almond milk to a boil. Add steel cut oats and stir. Bring to a simmer, cover and let cook about 10 minutes, or until liquid is absorbed. Remove from heat. Stir in pumpkin and spices. Top with Walnut Maple Cream. This would be such a comforting breakfast this morning Shelby before I head to work. Wow, so festive looking! Beautiful. It looks so appetizing and comforting! Oatmeal and maple together taste great. How many cups of steel cut oats did you use? Oops, thanks for pointing that out Granny! I added the oats…its 1 cup. I used the same ratio on the package except I used 1 cup almond milk in place of 1 cup of the water. Looks like a fabulous breakfast! I like your way of eating oats better than grumpy's 😉 This looks delicious. I seriously love oatmeal, and pumpkin so there's no question here. The nice thing about colder weather is having oatmeal in the morning. I just use instant and add lots of cinnamon and some stevia. I'm a big fan of oatmeal, and since I have a hubby who needs to reduce his cholesterol levels too, I'll see if likes this. Besides, pumpkin is packed with good for you stuff, so why not add it to your oatmeal. Delish if you ask me!